So please do not post here but post on the Facebook MAGAM group page. Or email Sarah Liz : stylishsarah251@gmail.com. Just kind of annoying, so I kept the shirt but didn't wear it. If you've never seen the book "Fine Machine Sewing", by Carol Ahles, I recommend it. I learned much more about sewing and my machine than just how to do fancier stitching, which is a big part of her focus. One of her common themes is taking ready-to-wear and improving on it, so an ordinary garment becomes special. And, one of her approaches is to use heirloom stitches to sew facings in place... just the ticket. right stitch, which as I recall is the "Parisian". Here's an example of a test stitch. Carol recommends this for facings with a folded edge, but it didn't quite work. Might also have been related to the size needle I was using at the time (too small). I spent quite a bit of time testing stitches, and was grateful to have my little pile of linen scraps, very handy. The stitches on the collar are original, the ones on the shirt front are new. One miscalculation was that the facings are not symmetrical when the shirt is buttoned, which to my eye looks a little off. So it's likely I'll wear it as an over blouse covering a tank, or maybe a sleeveless dress. L'année dernière(déjà),une épaisse robe de chambre s'est invitée dans ma garde robe pour avoir bien chaud le soir dans la maison de ma fille .Oui,oui,car elle vit et travaille à la montagne,dans une vieille ferme et la neige blanchit souvent le paysage. Comme il me restait du tissus imprimé de style japonais , l'idée d'un pyjama...donc,vite chez Toto pour acquérir un coupon de popeline pour chemise.Il y a du repassage dans l'air. patron Burda,en allongeant les jambes. le plus dur a été de recouvrir les boutons,un conseil:acheter des boutons à recouvrir de bonne marque,ceux qui sont moins chers ne résistent pas et se ferment moins bien! J'avoue ne pas coudre aussi vite que pendant une période passée,mais j'aide une amie à faire un manteau de coupe compliquée.Nous pensons le mettre sur ce blog bientôt. Et puis,une folie:achat d'une jupe de belle facture dans un magasin caritatif...en taille 42,que je vais essayer de réduire en 36. Les champs autour de la maison,en Auvergne ,au centre de la France.C'est la nature et le grand air loin des villes . 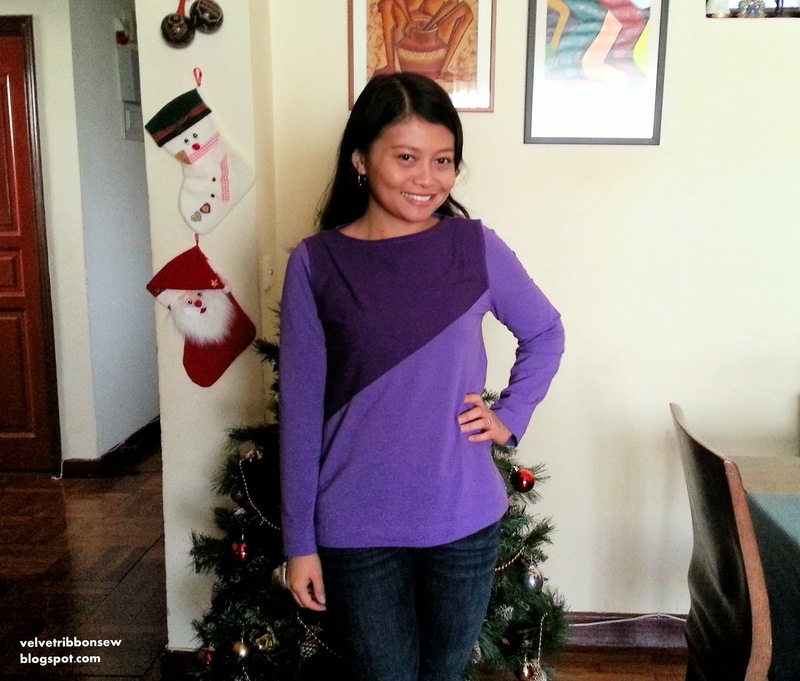 This will be my last post on the Make a Garment a Month Blog. You have all been a wonderful community and we've made some great garments - it's always a pleasure to see what everyone has made. For personal reasons, I can no longer facilitate this blog - it does take quite a lot of time, and I need that now as off blog life is very busy. Facebook is a much more interactive medium, which works well for a community group. Already our numbers have expanded and there is a lot more creative energy within the group. It's a great pity that some of you can't come over - but you all have sound personal reasons as well- so I'd like to take this opportunity to wish you well. And you can always follow our members on their own personal blogs. I finished my December top exactly in the end of the month but as usual I am late to posting it. Happy sewing and see you all in our Facebook Group! For personal reasons, I can no longer facilitate this blog - it does take quite a lot of time, and I need that now in my off blog life as it is getting busier. I also find that Facebook is a much more interactive medium, which works well for a community group. already our numbers have expanded and there is a lot more creative energy.